What is Diaba Plus ? How Diaba Plus+ Works ? Diabetes is a condition in which the body cannot control the level of glucose (sugar) in the blood because the pancreas does not produce insulin or produces inadequate amount of insulin or the body cells become resistant to insulin. Insulin is a hormone that is needed to convert sugar, starches and other food into energy needed for daily life. The failure of a gland called Pancreas, which lies behind the stomach, is the cause of diabetes. This gland either fails to produce or produces insufficient quantities or quality of the hormone called 'Insulin', without which we have no means of producing energy from the sugar contained in the food we eat. . When someone has diabetes, their body can’t maintain healthy levels of glucose in the blood. Glucose is a form of sugar which is the main source of energy for our bodies. Unhealthy levels of glucose in the blood can lead to long term and short term health complications. For our bodies to work properly we need to convert glucose (sugar) from food into energy. A hormone called insulin is essential for the conversion of glucose into energy. In people with diabetes, insulin is no longer produced or not produced in sufficient amounts by the body. When people with diabetes eat glucose, which is in foods such as breads, cereals, fruit and starchy vegetables, legumes, milk, yoghurt and sweets, it can’t be converted into energy. 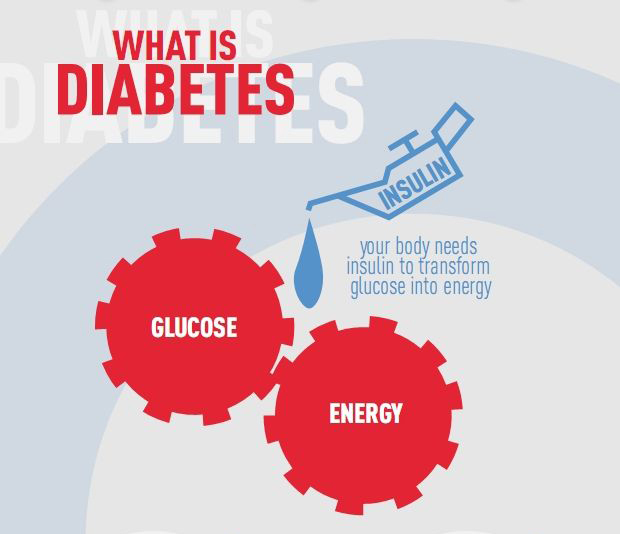 Instead of being turned into energy the glucose stays in the blood resulting in high blood glucose levels. After eating, the glucose is carried around your body in your blood. Your blood glucose level is called glycaemia. Blood glucose levels can be monitored and managed through self care and treatment.